When it comes to reviewing skin care products, I definitely try to put myself in the shoes of people who have different skin than I have and be constructive about products that don't work for me based on my skin type. But honestly, there's no way I can make guesses when it comes to how a product will work on mature skin because I'm in the early signs of aging stage myself and there's just really no guess. 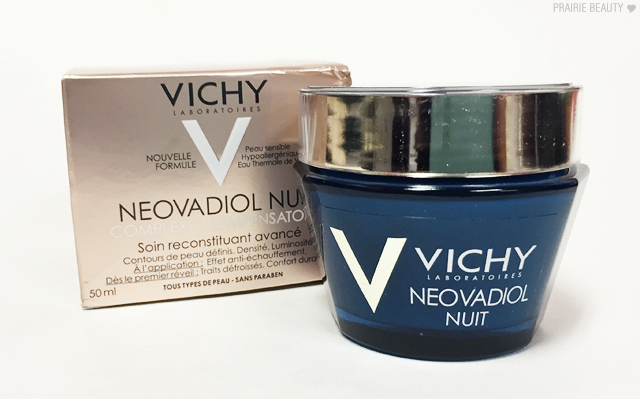 SO, when I heard that VICHY was releasing Neovadiol Night Compensating Complex*, a product designed to support menopausal skin, I absolutely had to pass it along to my mom, get her to use it consistently for a few weeks, and then ask her some questions and summarize her experience for you guys! I didn't tell her about any of the claims that the product made, because I wanted her to tell me exactly how she felt about it without any of that in her head. Wanna know how this worked out for my mom? Keep reading! For a little bit of background about my mom, she has been consistently using a skin care routine for as long as I can remember and is consistent about cleansing, toning and moisturizing her skin, though she hasn't gotten much into anti-aging products overall. Her skin is generally normal and leans dry in the colder months of the year. 1. 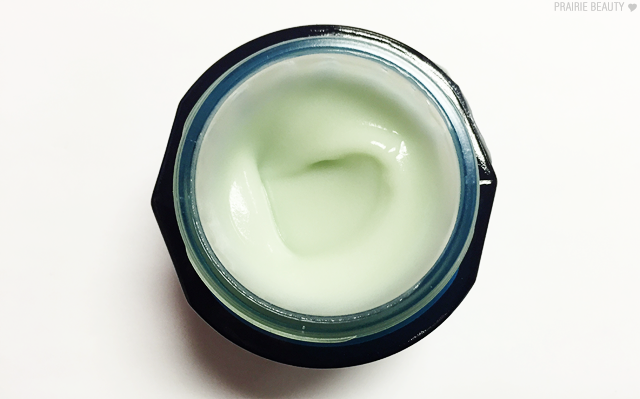 Describe the texture & scent of the product. 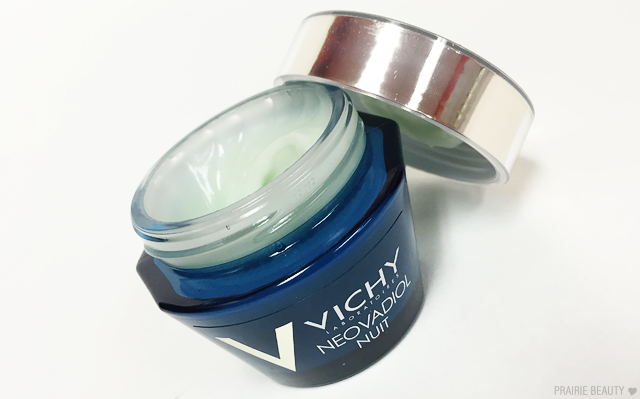 The texture of the Vichy moisturizer is smooth and creamy and not too thick. It has a pleasant mild scent. 2. 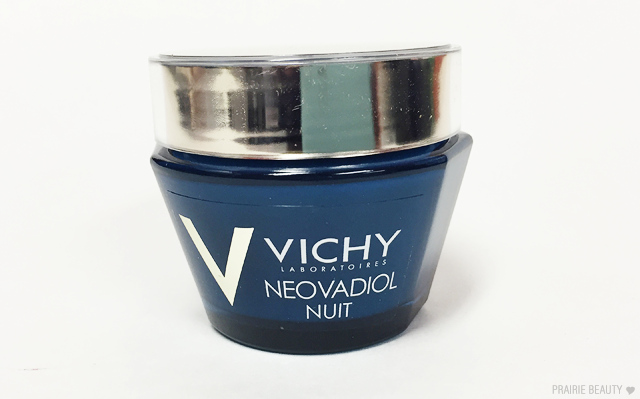 Describe how the product feels when you apply it to your skin. When applied it gives my face a cool feeling and doesn't make my face red and blotchy. It's not oily. While it's on I can feel my skin tightening. 3. What effects have you seen in your skin since you started using the product? Since I started using this product the appearance of my pores have changed. They aren't so noticeable and my skin feels softer and not so dry. 4. Will you continue to purchase the product? I have been looking for a moisturizer that's not greasy, doesn't make my face red and one that I can actually see a good difference in my skin. This is the one and I will continue to purchase it. I can tell you that within about a week and a half, I was really surprised to see the effect this had on the appearance of my mom's skin. The surface of her skin looked quite a bit smoother and the appearance of her pores was significantly diminished. I think there was a definitely some tightening, but the difference was definitely most noticeable in the surface texture and appearance of her pores. I also think there was definitely some overall added radiance to the look of her skin. Overall, this definitely gets a three thumbs up - one from me and two from my mom, who is already talking about repurchasing this when she finishes the jar. I really didn't think that I would be able to see such a significant difference in the appearance of her skin in just a couple of weeks, but I definitely saw a difference and I think she really felt an even more significant difference. 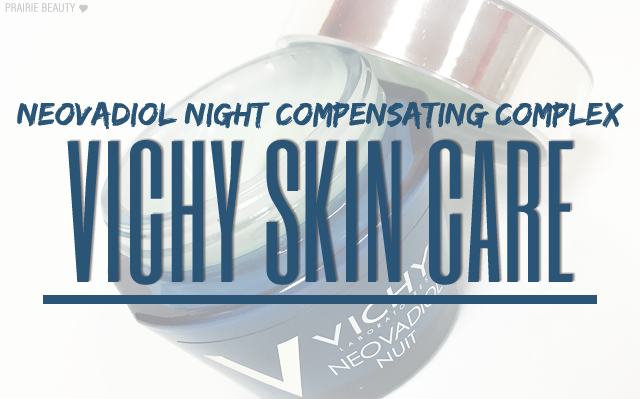 The VICHY Neovadiol Night Compensating Complex* is available now wherever on VICHY.ca and at pharmacies nationwide! Thanks for reading - and supporting my mom's first foray into beauty reviews!